Eastern Maine’s Cobscook Bay State Park (US Route 1, Dennysville; 207-726-4412) is perhaps best known for its camping; this 888-acre park offers 106 tent and RV campsites with hot showers, many of which are right on the ocean. 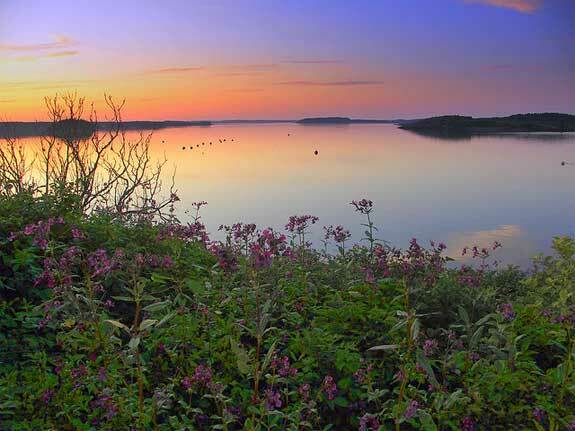 The park is surrounded by the waters of Cobscook and Whiting Bays and is home to more than 200 species of birds – in fact, it’s part of the Moosehorn National Wildlife Refuge. Visitors can beachcomb and clam during the impressive low tides and walk along the coastline to Passamoquody Bay. Camping season runs from May through October and pets are welcome. Entrance fees start at $3 for adult residents, $4.50 for non-residents, $1.50 for seniors, and $1 for children. Located near Bar Harbor, Lamoine State Park (23 State Park Road, Ellsworth; 207-667-4778) offers a quieter, calmer and less-crowded alternative to busy, nearby Acadia National Park. This state park is known for its boating opportunities, as well as its proximity to some of the most popular vacation destinations in the state. The park encompasses 55 acres of oceanfront land and has its own boat launch on Frenchman Bay that’s open during the summer months. Visitors can camp along the seaside bluffs, fish, sea kayaking and watch for wildlife at this scenic spot. Dogs are welcome. Entrance fees start at $3 for adult residents, $4.50 for non-residents, $1.50 for seniors, and $1 for children. Quoddy Head State Park (973 South Lubec Road, Lubec; 207-733-0911) is open from May 15 through October 15. This 541-acre park –which sits at the tip of the easternmost peninsula in the U.S. – is perhaps best known for its wildlife watching opportunities; summer visitors may glimpse minke, humpback and fin whales, while migrating sea birds flock to the area throughout the year. The West Quoddy Head Light was built in 1808 and overlooks New Brunswick on the other side of the Quoddy Channel. Visitors can walk the one-mile trail through the park’s boggy wetlands and explore the beach. Leashed pets are allowed. Entrance fees start at $2 for adult residents, $3 for non-residents, $1 for seniors and $1 for children. Roque Bluff State Park (145 Schoppee Point Road, Roque Bluffs; 207-255-3475) encompasses 274 acres on Schoppee Point. It has a saltwater swimming beach on English Bay, a freshwater beach on Simpson Pond, a playground, picnic areas and 6 miles of trails that wind through forest, fields, orchards and along the seashore. Rent kayaks and explore the pond or try your hand at fishing. The park doesn’t allow dogs on the beach. Entrance fees start at $3 for adult residents, $4.50 for non-residents, $1.50 for seniors and $1 for children. Shackford Head State Park (Deep Cove Road, Eastport; 207-941-4014) sits on a 90-acre peninsula in Cobscook Bay. The undeveloped area is crisscrossed with hiking trails that wind along the coast, offering birdwatching and beachcombing opportunities. Bring a picnic and keep your dog on a 4-foot-or-less-long leash. Entrance fees start at $2 for adult residents, $3 for non-residents and $1 for seniors and children.